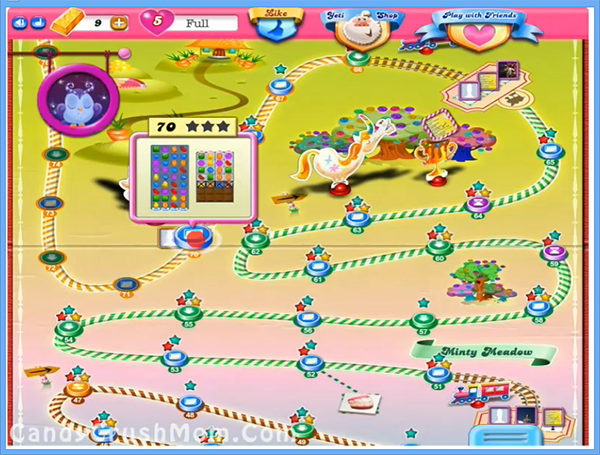 This level have again almost same candy board to previous level and have 28 jellies, 8 chocolates and four grill boxes. To complete this level you need to play with good strategy and if you already played lot of level then it wont be hard for you. First you should try to play on right side of board to break grill boxes and chocolate or in left part of board if you have chance to make special candies. You have 45 moves and its much for this level and you should try to break all chocolates so they wont increase and waste moves. We completed this level with 100320 score by combining special candies and use other tricks plus we got single colorbomb that help to complete level within 23 moves and rest converted to fish booster.